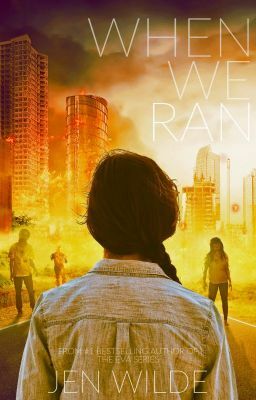 Introducing WHEN WE RAN - the long-awaited spin-off to THE EVA SERIES! COMING 01.01.17. In Jen Wilde's #1 bestselling AS THEY RISE, we followed Eva and her friends as they road tripped across a zombie-infested Australia. In BEFORE IT FADES - the third book in The Eva Series - we met Lea. Now it's time to go back to where her story began. In this long-awaited spin-off of THE EVA SERIES, Lea is just trying to enjoy date night with her girlfriend, Skye, when a deadly outbreak begins. In a matter of hours, Sydney transforms into ground zero and is forced into lockdown. With half the city quarantined by the military and no one coming to save them, Lea and her friends must take the resistance into their own hands. But when Lea and Skye end up on either side of the barbed wire fence, Lea sets herself a new mission: find her girlfriend and get out of the city for good. The Eva Series reached over 4 million reads online, and now in WHEN WE RAN, the story continues with an all-new heroine. LEA'S STORY BEGINS 01.01.17. ADD THIS BOOK TO YOUR LIBRARY & READING LISTS to be the first to know when chapters are posted!